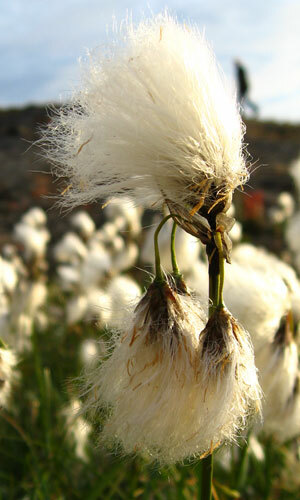 The Bog Cotton is a hardy, herbaceous, rhizomatous, perennial sedge. It is very common in Mayo and can be found on peat or acidic soil and in open wetland. It flowers in April with a single flower head, but becomes curious and breathtaking in summer and autumn when after fertilisation a conspicuous, white, cotton-like mass appears. This mass is composed of seeds with hairs and it aids in wind-dispersal or in trapping solar radiation. In the past this "cotton" was used as a feather substitute in stuffing pillow or other clothes. The tender plant can be eaten by sheep, cattle and geese. Its botanical name is Eriophorum Vaginatum and the Irish one is Ceannbhàn.